When the coalition government was formed in 2010 Andrew Lansley was appointed secretary of state for health, and he moved the responsibility for nutrition from the FSA to the Department of Health. This disrupted the salt reduction programme, making it unclear who would be responsible for the policy. In 2011 Lansley launched the Public Health Responsibility Deal, making the alcohol and food industries responsible for reducing alcohol consumption and improving nutrition, respectively1. As a result, salt reduction lost momentum. The majority of non-governmental organisations that initially signed up to the deal subsequently withdrew over concerns that the interests of industry had been prioritised over public health and that no commitment was made on alternative actions if the pledges did not work. The food network of the responsibility deal was overseen by a high level steering committee that met 4-5 times a year. Of great concern was that the committee was dominated by the food industry after the withdrawal of so many non-governmental organisations2. Action on Salt had several meetings with Lansley and the Department of Health between 2010 and 2012, during which Lansley said that he wanted to scrap the salt targets for 2012. After strong lobbying from Action on Salt he agreed to accept them but refused to set new targets for 2014. He also relaxed the reporting mechanisms, enabling the food industry to present their own feedback, which made the information harder to analyse. This lack of clarity resulted in many companies stopping or slowing down their planned reductions in salt added to foods3. The responsibility deal seemed to be a way of getting the food industry involved in improving nutrition without the Department of Health having to take much responsibility. This gave the food industry the potential to make exaggerated claims on what they were achieving. Throughout the salt target meetings in 2013 it became clear that some companies had failed to meet the 2012 targets, and little was done about it4. When Lansley left the Department of Health in 2012, Anna Soubry was appointed minister for public health and agreed to reset the salt targets. New targets were set in 2014 to be achieved by 20175. But many of the targets were not as low as originally suggested by the Department of Health and Action on Salt, owing to apparent food industry lobbying. Furthermore, the department refused to provide any funding to investigate technical problems raised by the food industry, such as the minimal level of salt necessary to inhibit Clostridium botulinum in meat products4. The lack of targets for 2014, and the fact that some food products had already met their 2012 targets, meant that companies had no need to make any further reductions. 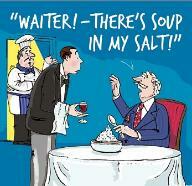 However, in March 2014, The Department of Health set new salt limits beyond 2012 for the food industry to achieve. These targets cover 76 categories of food and are on average 10% lower than the 2012 targets. A new set of targets for the out of home industry were also published - Out of Home Maximum per Serving Salt Targets - in an attempt to get the out of home sector on board, and develop a level playing field6. Following the UK general election in 2015, the Public Health Responsibility Deal was dissolved. O’Dowd A. Government’s public health responsibility deal is met with scepticism. BMJ 2011;342:d1702. Department of Health. Public health responsibility deal. https://responsibilitydeal.dh.gov.uk/salt-target-categories/. Food Standards Scotland. 2017 salt targets. foodstandards.gov.scot/2017-salt-targets. Food consumed out of home makes a significant contribution to our daily diets with an estimated 1 in 6 meals being eaten out of the home. It is also often saltier than similar foods sold at retail . Therefore the catering sector have a huge role to play in helping consumer’s to reduce their salt intake to meet the 6g a day population target.For too long the out of home industry were left out of the salt reduction programme, stalling efforts made to reduce the salt intakes of many people in the UK. In June 2012, the Department of Health and the Food Network announced separate pledges specific to caterers as part of the Responsibility Deal, in a bid to enable caterers and their suppliers to play a fuller part in salt reduction. Three separate pledges were announced, to capture the potential for salt reduction in an area of the food industry which has thus far been left behind. The salt catering pledges, which focus on three key areas (training and kitchen practice, reformulation, and procurement) were designed to support the salt pledge, but also in conjunction with each other. UPDATE 2016 - The Public Health Responsibility ceased to function. Consequently the above pledges are no longer in operation. Unfortunately, sign up to these pledges was poor. The out of home sector play a huge role in the amount of salt we eat, and more interest from restaurant chains and popular eating establishments is vital if this area is ever going to catch up with other retailers and food manufacturers. Targets have been developed for 11 food categories [DOC 22KB] (24 sub categories), based on the ten most popular food groups purchased in the out of home sector with the addition of a specific target for children’s meals. These were originally developed by the Department of Health under the Responsibility Deal, and is now being dealt with by Public Health England.